This stunning pool was renovated by Graziani Pools to provide the long-lasting, low-maintenance result that the clients requested. With fantastic city views and a swim-up bar, the pool is the perfect at-home getaway. 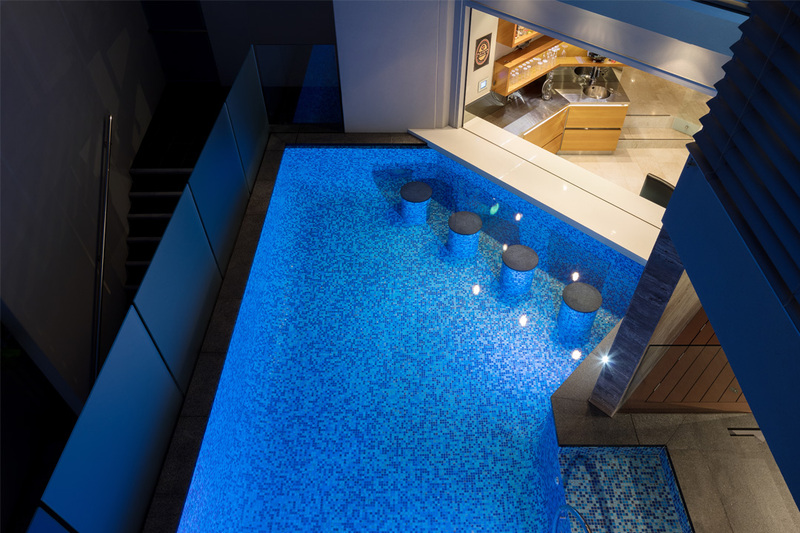 The clients’ existing pool was severely leaking and difficult to maintain. To fix these issues, Graziani Pools waterproofed the concrete shell several times, and replaced the glass panels with a durable concrete material. Mosaic tiles feature throughout the interior of the pool for a cohesive and relaxing aesthetic. 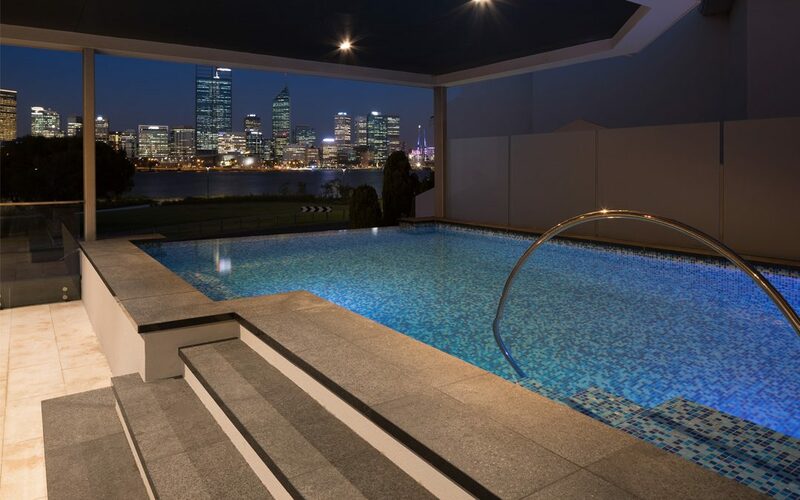 Located on the second floor of the clients’ home, the pool’s infinity edge offers seamless views of Perth. Measuring 9m x 4m, the pool is ideal for exercise. The addition of submerged stools next to the swim-up bar also makes it a great place for entertaining. 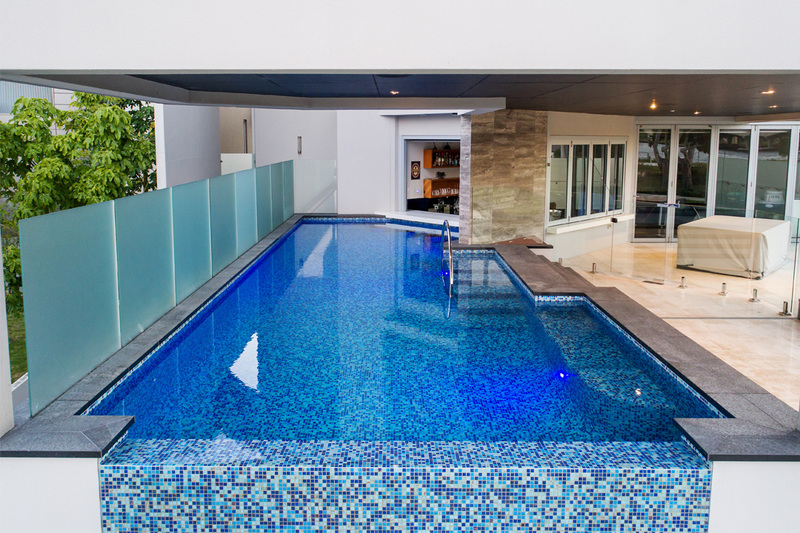 Fitted with a Chemigem automatic chlorinator system, the pool stays pristine with little effort. Specialising in all types of pools, Graziani Pools was founded by Don Graziani and has been successfully running for more than 49 years. Building approximately 15–20 pools per year, the company specialises in unique and expertly engineered pools with automatic covers and in-floor cleaning systems. Graziani Pools’ team offer a respectful, hands-on approach to every pool they complete. The team will pay you a friendly visit, listen to your individual requirements and make recommendations to ensure your dream pool is brought to life. Graziani Pools builds throughout Western Australia – from Broome down to Albany – and overseas in Malaysia and Macedonia. From lap pools and spas, infinityedges, and wet decks, to automatic pool covers, no job is too difficult for Graziani Pools.